Every fall, when the weather turns cool, I dread the annual influenza season — and the annual influenza vaccine. I don’t mind giving flu shots, or getting them. What I dislike is trying to convince certain patients that they are mistaken in believing that immunizations against influenza and other infectious diseases are dangerous and ineffective and even part of a nefarious conspiracy between the government and Big Pharma. How did vaccines, which have saved millions of lives and eliminated or greatly reduced the incidence of scourges like polio, measles, tetanus, and influenza, become objects of fear and suspicion? 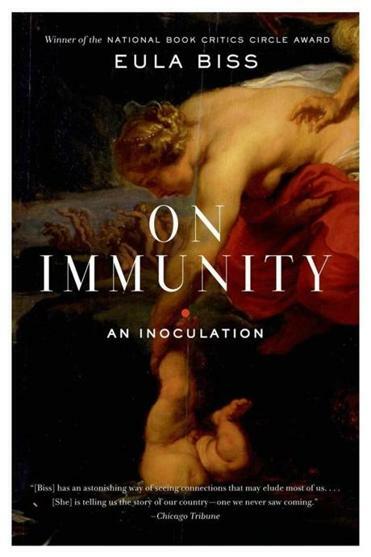 “On Immunity: An Inoculation’’ is Eula Biss’s elegant and thoughtful response to this question. Part memoir, part history, part social criticism, this meditation on immunity from medical, literary, political, historical, linguistic, and personal perspectives is a welcome antidote — or “inoculation,” as the subtitle suggests — against the toxic shouting match occurring between “anti-vaxxers” and their opponents. Biss, a young, Chicago-based writer whose spare style and sharp intelligence have already earned her comparisons to Joan Didion and Susan Sontag, is the author of two previous provocative works of nonfiction: “The Balloonists,’’ about marriage, and “Notes From No Man’s Land,’’ a collection of essays on race, which won the 2010 National Book Critics Circle Award for criticism. In these volumes, as in “On Immunity,’’ Biss makes the familiar unfamiliar. She disorients readers by juxtaposing topics we don’t immediately recognize as related to each other. In “The Balloonists,’’ for example, Biss splices facts about flight data recorders with quotes from family members about her parents’ divorce (trust me, this works). In “Time and Distance Overcome,” an essay in “Notes from No Man’s Land,’’ passages about the history of the telephone pole and the history of lynching alternate. Though the essay may be more a congenial vehicle than a book-length work for her uniquely digressive style, in “On Immunity,’’ Biss leaps nimbly through a vertiginous range of subjects. Vampire lit, Marxist theory, Rachel Carson’s “Silent Spring,’’ Voltaire, “Star Trek,’’ and George Washington’s Continental Army all, we’re surprised and delighted to find, inform our understanding of immunity. Biss anchors this freewheeling exploration in her own story. She’s faced with the decision about whether to have her baby vaccinated in what, she observes, “ . . . was not a good season for trust.” Her son, born in the spring of 2009, around the time of the H1N1 flu pandemic, a few months after the financial crisis of 2008, and shortly before the BP oil spill, is vulnerable to myriad forces beyond Biss’s control. The possibility that his crib mattress may contain harmful chemicals reduces her to near panic. Biss doesn’t accept this explanation at face value and, she argues implicitly, neither should we. Fear of immunization is as old as the practice itself, versions of which existed in folk medicine centuries ago. Those who think the antivaccine movement started with Jenny McCarthy will be interested to learn that the term “conscientious objector” first referred to people who refused compulsory vaccination in Victorian England. Biss tells us early on that she elected to have her child fully immunized. What will keep readers turning the pages of “On Immunity’’ isn’t suspense about Biss’s conclusions, but suspense about our own. Will this brilliant and entertaining little book dislodge preconceptions about vaccines or create better understanding of why so many fear them? It did for me. After reading “On Immunity,’’ I’ll enter flu season this year no less committed to innoculating my patients, but with greater compassion for those reluctant to be innoculated.